“God speaks to us in different ways. 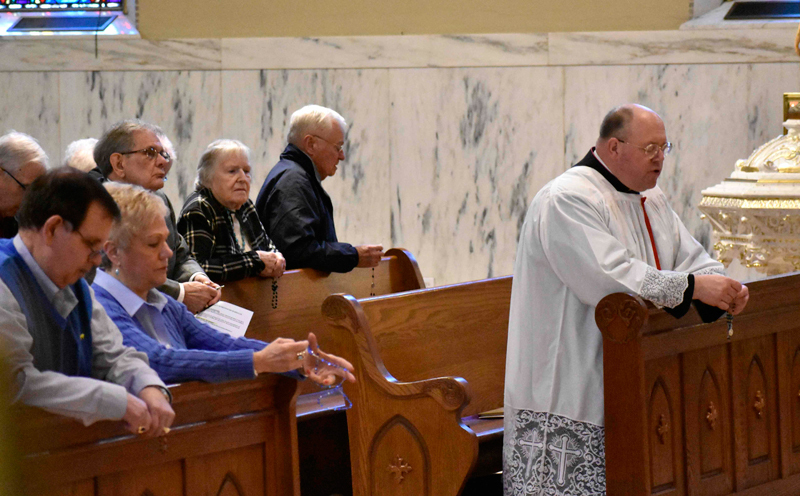 If someone says to a young man, ‘I think you could have a vocation to be a priest’ you’re really being the voice of God to them,” said Monsignor David James, addressing Serrans at their annual Day of Prayer for Vocations. 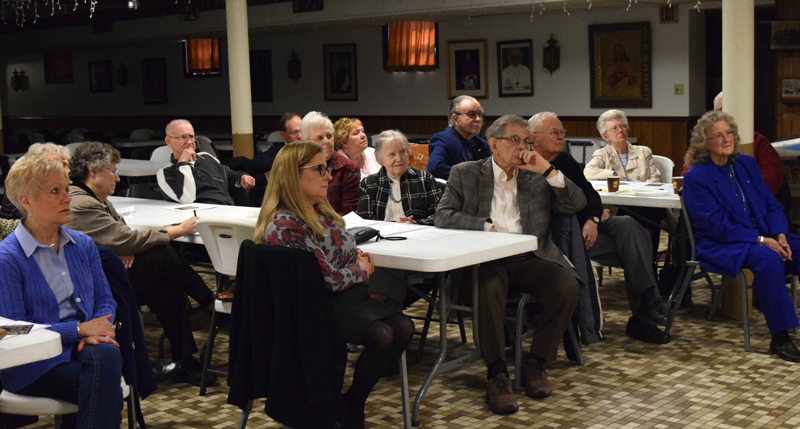 “You’re living out your faith – you know the qualities of a good priest,” Monsignor James said at the morning gathering hosted by the Serra Clubs of the Diocese of Allentown April 7 at St. John the Baptist, Allentown. Monsignor James, Diocesan vicar general, and Barnabite Father Dr. Robert Kosek, administrator of St. John the Baptist and SS. Peter and Paul, Allentown, were speakers for the event. The day began with Mass at 8 a.m., followed by registration and continental breakfast. The event included Benediction, Rosary for Vocations, and Litany for Vocations composed by Monsignor James, chanting of Divine Mercy Chaplet, scriptural reading, reflection by Monsignor James and opportunity for confession, and concluded with a light lunch. Serra is a nonprofit Catholic organization made up of laymen and laywomen whose mission is to pray and work to foster, promote and affirm vocations to ministry in the Catholic Church. Its name is derived from St. Junípero Serra, a Franciscan missionary priest who established many missions in California in the late 1700s, and was canonized by Pope Francis Sept. 23, 2015. Marie Mazzini is District Governor. Everyone was invited to attend and experience the joy and peace of the Risen Lord that awaits in Adoration of the Blessed Sacrament, and join in asking the Lord of the Harvest to bless the Diocese with many more vocations. Addressing Serrans, Monsignor James, Diocesan director of vocations, noted that Bishop Alfred Schlert has announced the organizational restructuring of the Diocesan Office of Vocations. Father Mark Searles will serve as director of Vocations Promotion and Father Christopher Butera as director of Seminarian Formation. “Father Butera will be interfacing with the seminaries and work with the seminarians in formation,” Monsignor James said. Father Butera will remain chaplain of Catholic Campus Ministry at Lehigh University, Bethlehem. Father Searles, chaplain of Allentown Central Catholic High School (ACCHS), will work with the St. Andrew Committee and go out to high schools as director of Vocations Promotion. They will begin their new positions Tuesday, June 19. “We’re blessed with 15 outstanding young men studying for the priesthood for our Diocese,” Monsignor James said. There are 13 seminarians at St. Charles Borromeo Seminary, Philadelphia, one at Mount St. Mary’s Seminary, Emmitsburg, Maryland; and one at Hispanic Seminary of Our Lady of Guadalupe, Mexico City, Mexico. Reviewing the prospects for next year, Monsignor James said eight young men are in the application process, though the interviewing has not yet begun. Five of them would be in college in the seminary, one in pre-theology and two in theology. “We’re seeing for the first time in years multiple vocations coming from one parish,” Monsignor James said. “Much of this has to do with the work you do in support of seminarians,” he told Serrans. 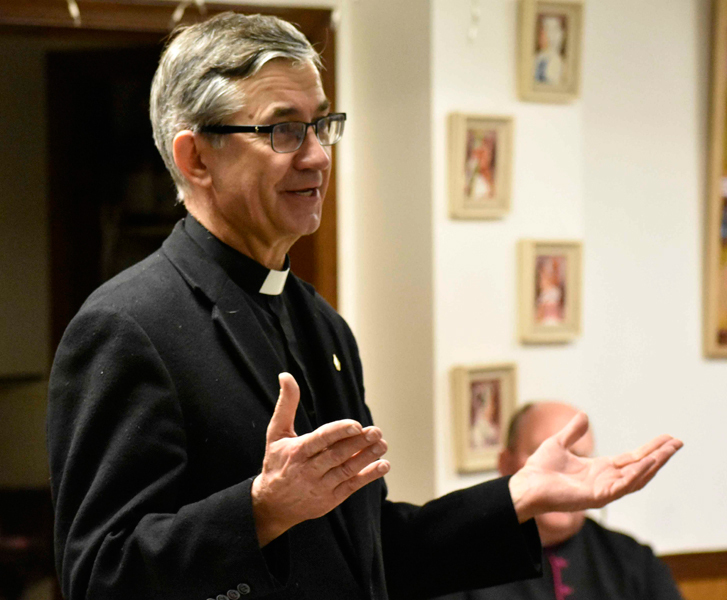 Monsignor James said Bishop Schlert has made it a priority to focus on vocations, and that it is a trend in the United States to separate formation and promotion in vocations to help concentrate on each. He noted Father Butera and Father Searles will report directly to Bishop Schlert so he will have first-hand knowledge of what is happening. He said factors such as poverty can sometimes lead people to become a priest. Father Paul Marconi, Father Kosek is the only Barnabite priest serving in the Diocese of Allentown. “What’s important is education, persistence and perseverance,” said Father Kosek. 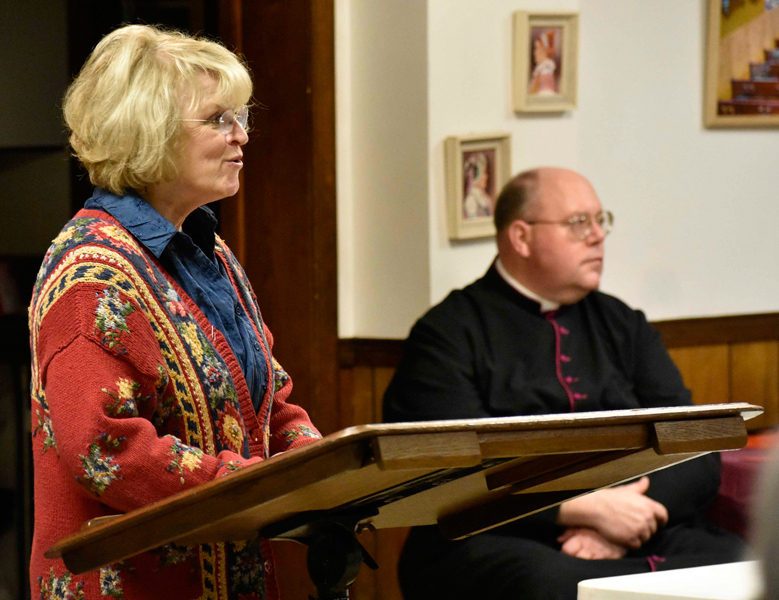 “Sometimes we pray for vocations to come and to stay in … it’s like falling in love without falling out of love,” Father Kosek said of a man staying with his priestly vocation. 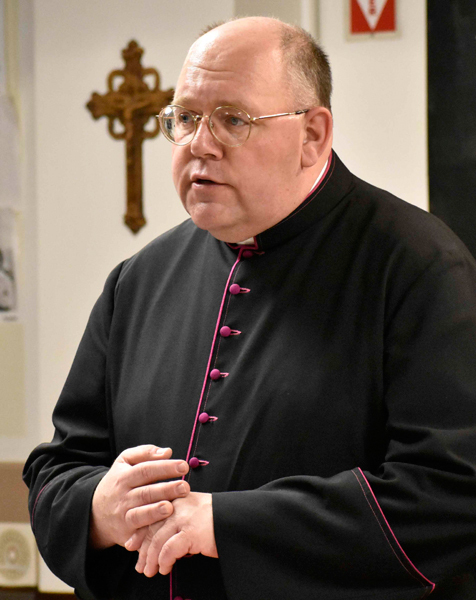 Father Kosek highlighted the importance of education and formation in seminary training, and emphasized the importance of prayer. “I’m grateful as a priest to see how much you care for the church. It’s inspiring,” Father Kosek told Serrans. He said vocations come from the family, and encouraged Serrans to support families. Father Kosek said he will attend the Barnabite’s General Chapter in Brazil in July, where the community will elect a new superior general. Marie Mazzini introduces Monsignor David James before his presentation. “Tell seminarians the story of your faith,” Father Robert Kosek tells Serrans. “We’re blessed with 15 outstanding young men studying for the priesthood for our Diocese,” Monsignor David James tells Serrans. Serrans, front, from left, Shirley Heidecker, Beth Stehnach, Joe Bechtel, Jim Hammer and Carole Yeager join the rest of the group in listening to the morning presentations. Gus and Shirley Heidecker, front left, join other Serrans praying as Monsignor David James leads the Rosary for Vocations.